This is a 12 inch high bust in a high fired bisque. Hand painted bronze patina. Signed and dated by Robert Toth. "By all means marry, if you get a good wife, you'll be happy. If you get a bad one, you'll become a philosopher. " Socrates was a Classical Greek philosopher. 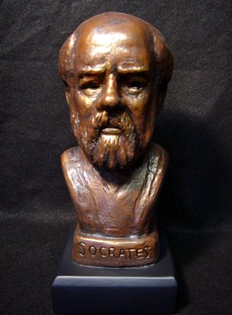 Socrates is credited with exerting a powerful influence upon the founders of Western Philosophy most particularly Plato and Aristotle, and while Socrates' principal contribution to philosophy is in the field of ethics he also made important and lasting contributions to the fields of epistemology and logic.